Hartlepool Toun Waw: datin frae the late 14t century, the limestone waw ance enclosed the whole o the medieval toun. The auncient hooses owerleuk the entrance tae Victoria Docks, which can be seen in the backgrund. Hartlepool (/ˈhɑːrtlᵻpuːl/) is a toun in Coonty Durham, Ingland. The toun lies on the North Sea coast, 7.5 miles (12 km) north o Middlesbrough an 17 miles (27 km) sooth o Sunderland. 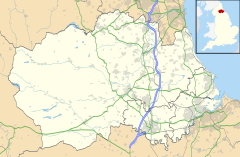 The Burgh o Hartlepool includes ootleein villages such as Seaton Carew, Greatham an Elwick. This page wis last eeditit on 20 Apryle 2017, at 21:46.